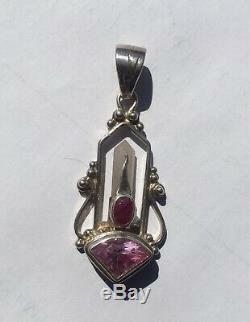 The Rising Fantasy pendant is a magnificent design by Shankari the Alchemist, handmade in Sterling Silver featuring a powerful combination of stones including a Rose Quartz Crystal set with a Ruby and a Pink Topaz gemstone decorated with a handmade Sterling Silver flame. The Flame represents your passion and desire. This will intensify your ability to give and receive physical affection. Rose Quartz is for Self Love, Forgiveness and Compassion. Rose Quartz will help you heal your relationship with yourself. By healing your relationship with the Masculine energy within you, you will heal your relationships with men. Remember to take the time to take care of You and experience more opportunities of love and nurturing by managing your time better. The Ruby gemstone is for your Nobility and Wealth. Experience abundance and magnetism as you embrace your inner Nobility. 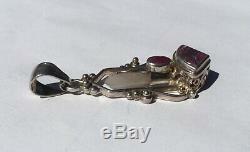 Generate new wealth through the support of the Ruby. 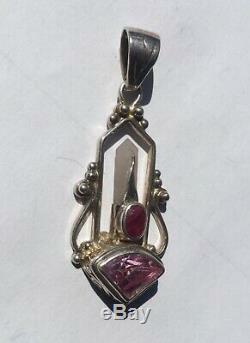 The Pink Topaz will help you develop your sense of Humor and Fantasy. Manifest your hearts deepest desire and release yourself from limitation. Pink Topaz will open your mind to the humor in your situation leading to more opportunities for laughter and joy. This three stone design will support your Creativity and help you reveal the Artist inside of you. Reveal your creative Spirit with this powerful Shankari Pendant. Pink Topaz: Humor & Fantasy. Rose Quartz Crystal: Compassion, Forgiveness & Self Love. Limited Edition and Completely Hand-made. It measures approximately 1.5 tall by 0.4 wide (4.7 by 2 cm). The item "Rising Fantasy pendant" is in sale since Saturday, March 16, 2019.